These waterfalls can be used to observe the multitude of MW (Medium Wave) stations on a single channel at the same time, even when only one station can be clearly heard. Or even when no station can be heard, such as with the 9 kHz channels from Europe and Asia. Carrier Sleuth does this by performing very long FFTs on the data, up to a 32 million point FFT. Carrier Sleuth is offered without any warranty at all. Use at your own risk. Guaranteed to blow up your computer, zap your radios, and destroy the ionosphere. Keep away from Al Fansome at all costs. Keep away from Al Fansome at all costs. I presume this download includes a rather large and compromising dossier on Belinda. Version 1.0.3 is now out, fixes a crashing problem when doing a 32M point FFT. Hopefully. 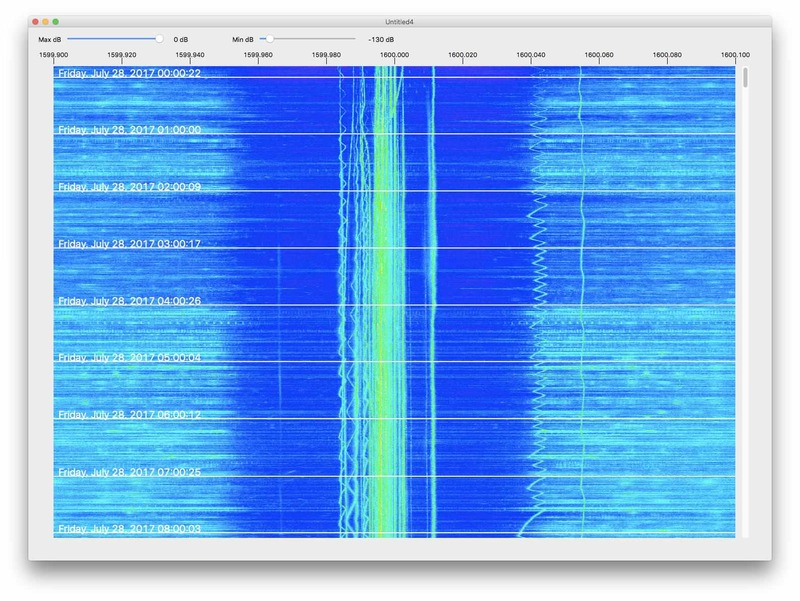 Very nice, Chris - I just tried out the Windows 1.0.3 version; I recorded a Perseus file ~ 12 minutes @ 125 kHz tonight and it processed just fine. Just for grins I re-ran it at 9 kHz spacing and darned if it didn't find some TA carriers that I didn't know were there. Nice work! I gave 1.0.3 for Windows a set of 125 ksps Perseus files and it still crashes on FFT size of 16M & 32M. With 1.0.4 on Windows, I fed it Perseus files at 16M & 32M FFT and it processed them fine. Do have a question about the display, the higher the FFT, the less vertical it becomes. Is that expected? Yes. Each line on the waterfall is the output of one FFT. So as you double the FFT length, you end up with half as many of them, so the waterfall is half as tall. Using a large air-cooler on the CPU now and it can handle Crysis, barely.